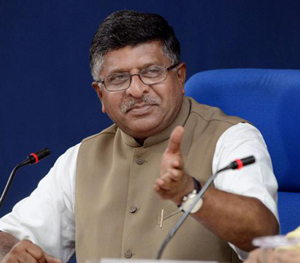 Udupi, Jan 26, 2017: Speaking to media on his arrival in the Udupi temple town on Jan 25, Wednesday, Union Minister of State for Law and Justice Ravi Shankar Prasad said Indian Constitution respects rights of women and dignity. Triple talaq, in that way, is unconstitutional. "We respect the freedom of conscience and worship. Every bad practice is not a part of religion and should not be. For instance, the practice of untouchability, which is permitted by the religion, however, is unconstitutional." Reiterating, that unicode is discussed by the Law Commission, the minister said, "We want to have a detailed discussion there. On the question of triple talaq, the Government of India has explained the position to the Supreme Court. Our position is that the triple talaq is bad on the grounds of gender justice, gender dignity and gender equality. In 20 Islamic countries, triple talaq has been regulated including Pakistan. If Islamic countries can regulate tripple talaq without any difficulty, how can such an argument be raised for India, which is a secular country, he questioned. To a query over Kambala, the minister said the Udupi district BJP president and Dakshina Kannada MP Nalin Kumar have given memorandum and representation on the issue. The government of India respects local custom and cultural tradition of diversity of India, be it Tamil Nadu or be it Karnataka. "I have been given the information that there is an interim order and he would prefer examining the order issued by the court," he said. "If the state government undertakes any legislative movement like ordinance or law and if it comes to us, we will be fully supportive of that. All traditions are part of cultural folklore of Tamil Nadu and Karnataka," he added. He expressed confidence over the BJP’s victory in the forthcoming assembly elections in five states. "We have won all the municipal elections in Maharashtra, Rajasthan, Gujarat and Chandigarh. We have also won the by-elections in Madhya Pradesh. He said that people in India want to move with the government led by Modi. He also recalled his association with Sri Krishna Mutt. Going down the memory lane, he said he had visited the temple way back with the former minister Advani in Chethana Yatra and also in 2010 for the second time. He said he is immensely happy to seek blessings from Pejawar Mutt seer. It is a privilege, he said and added the seer is a respectful saint of India. Earlier, he offered prayers to Goddess Sri Mookambika in Kollur before visiting Sri Krishna Mutt. He along with his wife, Maya Ravishankar Prasad, visited Kollur and offered prayers to the Goddess. He had the darshan of the Goddess and performed puja under the guidance of the main priest. He contributed Rs 21,000 through digital mode transaction for ’Annadana’ (mass feeding), which takes place everyday in the temple. It waste commenting on Triple Talaq of Muslims . When they do not have any problem why should we bother and waste precious ?